Forstau is a village in the Pongau area of Salzburg. It has a total population of approximately 551 and is mostly known as a skiing town (like most communities in the Pongau, actually). Forstau and neighbouring Radstadt share the skiing area of Fageralm. Whilst this skiing area is rather small, the big and trendy skiing towns are within reach of Forstau, for example places around the Dachstein (Schladming, Russbach, Annaberg). 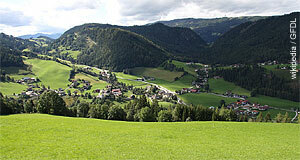 Geographically, Forstau can be found between Schladming and Radstadt. Due to its remote location. it developed relatively late - probably in the Middle Ages. In terms of noteworthy attractions, there is a parish church in Forstau that was built in 1742. It comes with a Baroque altar and is dedicated to St. Leonhard, the patron saint of cattle (a very popular saint in Salzburg for obvious reasons). The Lourdes Chapel was built in the late 19th century and contains stalagmites from Lourdes, the famous town of pilgrimage in France. The chapel is nothing overly exciting, though. When it comes to outdoor things, Forstau has more to offer. The immediate surroundings are very suitable for some attractive hiking. Several Almen (mountain cabins that provided a seasonal place to live for shepherds that kept livestock at high altitudes during the summer, since these regions would be too hostile to live in all year round) are managed as inns nowadays and are popular destinations for hiking tours. Note for example the Fallhausalm, which was enhanced by questionable artwork by Roland Mayer.